Oh dear, bit of a fail. It tasted good, but it just didn’t set properly. Which is why the chocolate shards have splayed outwards and the pear ghosts are slowly sinking. I followed the recipe exactly as prescribed, aside from one difference – the recipe calls for “12 butterscotch candies”, I wasn’t completely sure what they meant by butterscotch candies, I think maybe they were talking about something like Werthers Original Butter Candies but anyway, I substituted those for Daim bars instead (which are the same as Heath or Skor bars), but I’m sure that wouldn’t make any difference to whether it sets or not. So I don’t know whether there is something wrong with the recipe, or whether I did something wrong in the process. I found that same recipe on their website too, and asked the question there in the comments about setting, not sure if anyone will answer. The picture is different on the website, I like the magazine version better with the thin shards, but the recipe is the same. Check here to see if they’ve replied to my question yet. Well, I’m copying the recipe below anyway, in case you want to have a go, but perhaps if you have your own no-bake cheesecake recipe that you know works, you might want to use that instead for the middle bit (just remember to include whizzed up butterscotch candies or Daim bars because they add scruminess). 1. Put the sugar, lemon juice, apple juice and 300ml (1/2pt) water in a saucepan just large enough to fit the pears snugly. Heat for 5 minutes until the sugar has dissolved, then immerse the pears. Simmer for 10-15 minutes, or until tender. Remove from the heat and leave to cool. Chill until needed. 2. For the base, line a 20cm (8in) springform cake tin with nonstick baking paper. In a bowl, stir the crushed cookies into the melted butter. Tip the mixture into the prepared tin and press down. Chill for 20 minutes or until firm. 3. For the filling, put the butterscotch in a blender and whizz to a fine crumb. Set aside. 4. Soak the gelatine in water for 5 minutes until softened. Remove from the water and squeeze out any excess liquid, then heat in a small pan until melted. Set aside. 5. Whisk the cream and icing sugar, until thickened. Whisk in the cream cheese and vanilla, then stir in the butterscotch and gelatine. Spoon the mixture over the biscuit base and chill for at least 4 hours, until set. 6. Cover a work surface with a large sheet of nonstick baking paper. To decorate, pour the melted chocolate over the baking paper and, using a palette knife, spread it out in a thin layer, about 3mm (1/8in) thick. Leave to set for 30 minutes, then slice into thin shards, roughly 2cm (1in) higher than the cake. 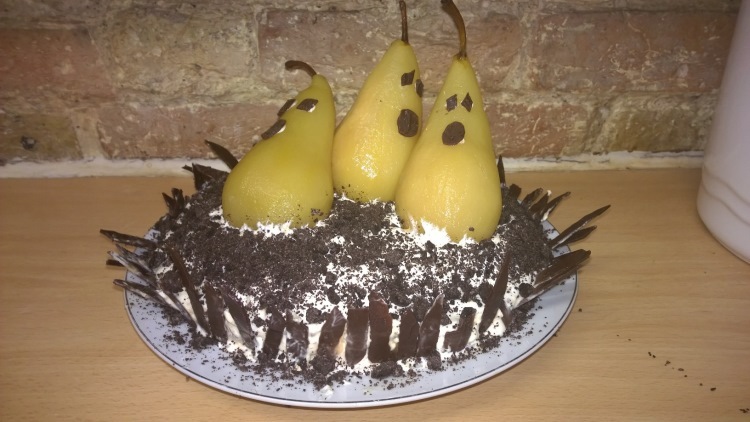 Reserve a little chocolate to make the ghostly pears’ eyes and mouths. 8. Run a palette knife around the cake to release it from the tin; transfer to a cake stand. Press the chocolate shards into the edges of the cake, all around. 9. Crush the remaining 4 cookies to crumbs and scatter over the cake. 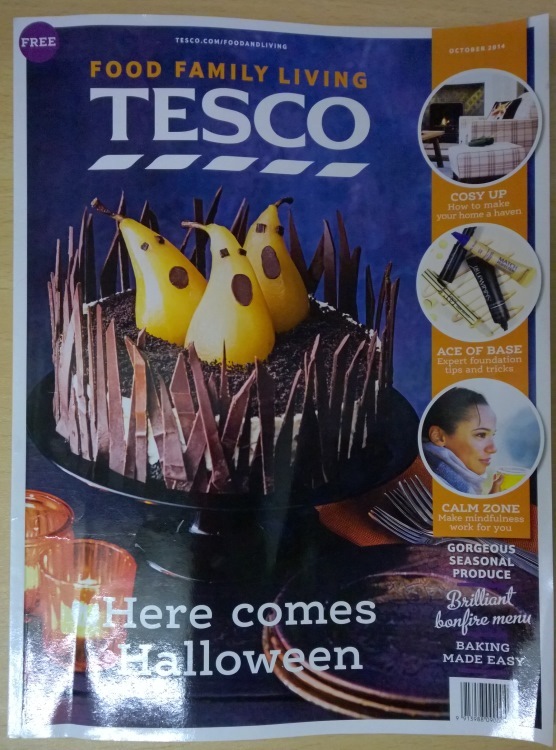 To serve, sit the ghostly pears in the centre of the cake. If you do make this yourself, or have any ideas why mine might not have set, do let me know below! Thanks Carrie. It’ll be such fun! We’ll have sleepovers and watch movies all night and eat…erm…nutritionally balanced and healthy meals! Yes? Aww thank you. I should just pretend that I actually wanted the pear ghosts to be sinking into the cheesecake for effect right? Yeah I guess, I mean, I didn’t expect it to look quite as perfect as the magazine one, but I also didn’t expect it to slowly spread out when I took it out of the ring! Maybe messy is better for halloween though, more horrorish! I was watching something on one of the cooking channels the other day and they said that low fat cream cheese can stop a cheesecake setting but I can’t remember if they were talking about baked or unbaked cheesecake. anyway, it still looks good! You know I wondered about the low fat cream cheese, I wouldn’t choose that myself but that’s what it said in the recipe so I followed that – unless that was a mistake in their recipe, don’t know! Thank you. I often get disappointed though when I try and make something that looks so perfect and professional in the picture!